Make a beautiful red raspberry Jello salad for your next dessert. 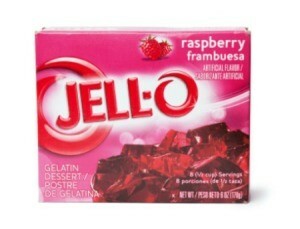 This page contains raspberry gelatin (Jello) salad recipes. Dissolve gelatin in 1 cup boiling water. Add unthawed raspberries and relish. Chill until set. Mix first two ingredients together until gelatin has dissolved. Mix all the rest together and pour in mold. Love the yummy berries in this salad! Dissolve 2 packages of gelatin in 2 cups boiling water. Do not add cold water. Add strawberries and raspberries along with 1/2 cup water. Pour into 9x13 inch pan. Combine marshmallows and sour cream. Let stand overnight. Whip this together (the next day) and spread over set gelatin. Love the frozen raspberries in this salad as well as the cream cheese. Great combination of ingredients here! Dissolve gelatin in hot water. Add raspberries. Put in refrigerator. Put marshmallows in a bowl and add whipping cream. Let set overnight. Slice cream cheese into marshmallows and whipping cream. Beat and frost the salad. Combine gelatin with hot water. Add raspberries and applesauce. Chill. Serves 6. Recipe for Red Raspberry Molded Salad. Dissolve gelatin in boiling water, add frozen berries and stir until berries have thawed. Let chill until it begins to thicken. While the gelatin is chilling, make the small cheese balls and roll them in ground nuts, pressing hard enough to make the nuts cling to the cheese.